The next time you visit Dresden or Berlin, take an escorted self-drive tour in the German Democratic Republic's two-stroke cult car, the Trabant or Trabi. The Trabant, a.k.a. the "Trabi," was the people's car of the German Democratic Republic. In just under 30 years, some 3 million plastic-bodied Trabant automobiles were manufactured in East Germany, mostly with two-cycle air-cooled engines that generated more smoke than acceleration. Buyers waited up to 15 years for their cars, and in some cases parents would order Trabis for delivery when their babies reached driving age or adulthood. Trabant production ended shortly after the reunification of Germany (or "the change," to use a term popular in the East). Residents of the former GDR rushed to buy Volkswagens, Opels, and other German cars, abandoning their Trabants by the side of the road or selling them to poorer neighbors for nominal sums (in some cases, as little as one Deutschmark, or about 25 U.S. cents). Fortunately, about 100,000 Trabants escaped the scrap heap and have become "cult cars" with collectors and nostalgia buffs. 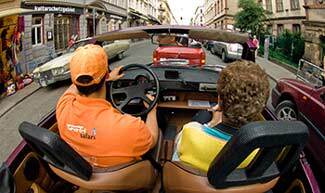 About 60 restored Trabants are in use by Trabi Safari, which offers self-drive escorted tours in Dresden and Berlin. The "Trabi Safari" concept is simple: You drive your own Trabant (sharing it with friends, if you like). A tour guide leads your convoy of up to seven Trabis, giving commentary and driving directions through the car radio. Tours last approximately 90 minutes. When you're driving, you won't have much time for looking at the sights, because you'll be focusing on the road ahead, on shifting gears, and on avoiding bicycles, pedestrians, and other cars. Our advice: Switch off with your passengers when you get tired of being the driver. You'll need your driver's license, so don't leave it at home if you want to putt-putt around Dresden or Berlin in a Trabi. For captioned photos and Web links, see page 2 of this article.